Ready for a little holiday mayhem? Then dive into Ghosts of Witches Past. It's the winter solstice in snowy Everland and the witching world is all aglow in twinkling illuma lights, enchanted fir trees, and sparkling snow. Holiday cheer is in the air for everyone—everyone, that is, except Elspeth Mayhem. Elspeth feels bewildered after losing so much time away from her daughters—Clover, Vivi, and Honora. The holidays remind her that, upon her return to Everland, she'd found three grown witches with lives of their own instead of the girls she'd left behind. Hoping to learn more about them, Elspeth turns to her old friend Esmeralda Card and her magical crystal ball to help her see into the past, her daughters' pasts. With Esmeralda as her guide, Elspeth visits Vivi's early days in The Potion Garden when a strange wizard tried to steal her potions, tags along on Honora's first case as a wannabe P.I. in the seedy magical streets of Stargazer City, and witnesses Clover's first success as a word witch as she sells her first Spellbinders novel while writing a dark fairy tale that might be a little too realistic. After witnessing their wild adventures, Elspeth reunites with her daughters and gives them a special Mayhem surprise to remind them of where they came from—a family of unique witches. 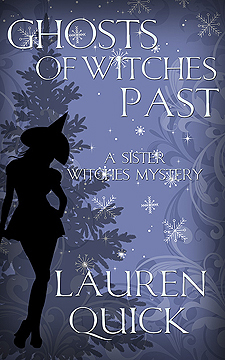 Ghosts of Witches Past is a special glimpse at the Mayhem Sisters when they were first exploring their persuasions and getting tangled in magical mayhem.